No, I did not come here to Piazza Santa Annunziata today to tour the museum of the Ospedale degli Innocenti or to see Ghirlandaio's Adoration of the Magi. Nor did I come here to stroll through its peaceful cloister or to observe Botticelli's Madonna and Child in its art gallery. Or to see the precious manuscripts and frescoes that adorn its walls. And no, I didn't come here today to gaze at Della Robbia's blue and white terracotta tondos, nor to admire Brunelleshi's renaissance porticos that flank the piazza. Today I was not here for the art. In fact I did not even know that this is where I was headed when I left my apartment this morning. 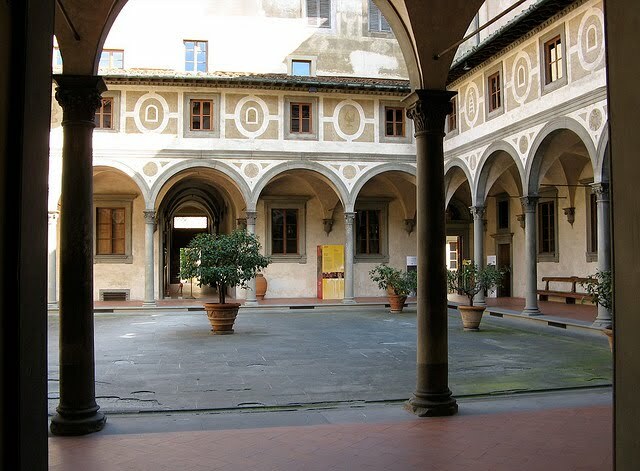 Today I discovered much to my surprise that the cloister (photo above) is also the home to the gynecological and oncological departments of Italy's national healthcare system in my quartiere (neighborhood) in Florence. An unexpected discovery. Last month I received a letter from the Gynecology Department of the Servizio Sanitario Nazionale (Italian healthcare system) offering me an appointment to take a PAP test. Although this subject may be of feminine interest, it stands as a good example of the excellent experiences I have had so far within the structure of the Servizio Sanitario Nazionale. As with all citizens of Italy, I am covered by the national healthcare service. However, as a new citizen, I have been learning the ropes on my own, with no guidance, or should I say it has been very limited. Thus, it has been somewhat frightful and mysterious. Although research helps, there is no substitute for experience. As soon as I received this appointment letter, I started forming a vision of what to expect. I immediately imagined an ugly crowded facility of people standing in line, filling out forms endlessly waiting with impatience their turn, similar to the horrific nightmare of a visit to the New York City Department of Motor Vehicles. Then told by a nurse practicioner to strip, open your legs, get dressed and you will receive the results in the mail before the turn of the century. Without further consideration, I filed the letter away and said "no way.” Such a private encounter warrants a private doctor. My standards are high even for an American, as I’ve always had executive healthcare coverage. I’ve never been to a clinic or an HMO, have had complete freedom-of-choice in the selection of doctors and facilities and have never had to wait for approvals for procedures or specialists. Could I really submit to the idea of socialized healthcare to the extent of standing in line with the masses to have someone treat my private parts like a number? Yet, over the past 2 years since becoming a citizen and being covered by the Servizio Sanitario Nazionale, I have had only good experiences. From my family doctor Lucia Ventura, an always-available 50 something professional with impressive credentials and a compassionate maternal bedside manner, to the radiological facility that I visited in Piazza Independenza for a routine sonogram last year, to the availability and ease of getting medicine and prescriptions, I have to say that so far, it’s even better than what I had in America. And from Italian friends who have lived here all their lives, I have heard nothing but positive and in some cases rave reviews. How can you beat a system where your family doctor still makes house calls? Not in America. So, to get back to my story (:), I’ve had one month to contemplate that letter. Last night I pulled the letter out again and saw that the appointment date was for the next morning at Piazza Santa Annunziata #12. How could I not want to go to Piazza Santa Annunziata for a doctor appointment? I go there for the art, the history, right? Yet I could not imagine where, within the piazza among the landmark buildings, museum, cloister, church, ospedale……where could there possibly be a public healthcare facility? And where else would I prefer to go? On a bus to the periphery? To a hospital? The piazza is a 5 minute walk from my house, in one of the 3 greatest historic piazzas of Florence. What more could I want? Realizing that I had nothing to lose, I planned to be there the next morning, if only to increase my knowledge of the system. As you have already guessed, it was a #10 experience. Hidden within a small corner of the quiet cloister was an unobtrusive door leading to the gynecology/oncology departments. I couldn’t believe it. I was here to see the Ghirlandaio exhibit only a month ago. Who would ever expect a public healthcare office to be embedded within the walls of this mecca of Florentine art? The same question I asked myself 2 years ago when I first visited my family doctor in her office at Piazza Santa Croce. I was dazzled and wanted to sing out loud. I walked into the office, where a small chatty lady sitting at a small desk welcomed me. It was quiet, just like you would expect of a cloister. I filled out a simple form and sat in a waiting room with 1 other woman. After a 15 minute wait, I was welcomed into the doctor’s office. She was the vision of a 50+Grand Madonna herself. Big warm smile, energetic yet calm. Long grey hair, glasses, natural, beautifully wrinkled skin, professional looking but more than anything else……passionate, compassionate and maternal. An instant feeling of warmth and confidence overcame me. The rest of the details….it was the best Gyn visit that I ever had in my life. Besides the procedure which was superior in every way, the stand-out point that immediately won me over, was her genuine interest in me. We ended up chatting for 15 minutes after the procedure, unhurried, about my ventures as an American transplant, which fascinated her. We shared our perceptions of American and Italian values. She was fully, completely engrossed in our moment. It was kind of like we were just hanging out. She didn’t want me to leave. I was floored. We connected on a level very much the same as I did with Lucia Ventura, my family doctor here in Florence. I still maintain a healthcare insurance policy in the United States. However, with my increasing confidence in the Italian system and the diminishing amount of time that I spend in the U.S., I am thinking of dropping my American policy and maybe buying some supplemental Italian private care, just in case. Giving up an American policy is a big thing, because once you lose it, try getting it back at my age. I am looking for guidance on this, and would like to hear from other ex-patriots and new citizens out there, what has been your experience? I hope I am not being naiive, thinking that every future experience here will be as good as what I have experienced to date. But I have not heard any horror stories yet. I really appreciate hearing from any of you who have had less-than-stellar experiences, especially with inpatient services, a topic which…..well, I don’t want to go there, but need to know. Thanks to all my new readers from the ex-pat community. And I am always looking to hear about your experiences on topics that are of mutual interest.